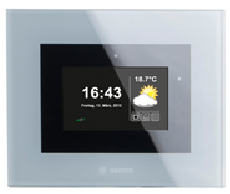 With the Becker B - Tronic Central Control - CC51 You can control your blinds and connected receivers via PC, Tablet or Smartphone from anywhere in the World. You can also keep an eye on things at Home or in the Office by utilising its built in Camera and if required add additional Camera's around the Home or Business via WiFi. The Wall or Desk mounted CC51 Touch Screen display is an ideal solution for upgrades in Retrofit applications.